The most sensible shoes for female travellers are those that comfortably match the activities in which the woman will be engaged. This means that boots are sensible when hiking, but sandals are sensible when at the beach. To get the best fitting, most sensible shoes for your trip, find your shoe size, know your activities, break in your shoes and always wear the right socks. When your feet are happy you’ll be happy. Even if you’ve been buying the same size footwear for years, before you go travelling you should have your feet professionally measured to make sure that you get the best fit from your new shoes. Try to go shoe shopping at the end of the day when your feet will have spread from all of your activity, and allow an experienced shoe salesperson to do the measuring. Good salespeople will also be able to advise you on the width of your feet, if it looks like you need extra arch support, and which brands generally meet the requirements of your sized or shaped feet. This may mean wearing a different size or different width depending upon the brand, so having an experienced expert on your side should help you cut down on trial and error. Once you have your foot measurements, tell your salesperson what kind of activities you need the shoes for. Will you be mainly sightseeing? Are you going on a trekking holiday? Is a visit to a river, lake or beach on your itinerary? The more you can tell the salesperson about your intended activities the better he or she can find shoes to match your needs. Once you purchase a pair of new shoes, wear them around the house for a few days before you travel. This will help break in your shoes and allow you to spot any potential problems while you still have time to rectify them. If you need to purchase insoles, buy new socks to get a good fit, scuff the bottoms to get a better grip or give yourself some time to develop blisters and toughen your skin, by wearing your shoes around your home for a few days you’ll come to know these things and decide if they are annoyances you can or will want to deal with while you travel. Keeping feet healthy in your new shoes begins with socks. The best socks for feet that are going to be in shoes all day are made of cotton. This fabric allows feet to breath and helps to cut down on fungus or other conditions developing. 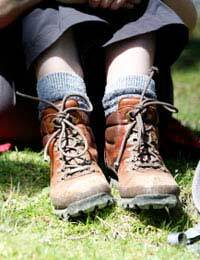 However, if you are going to be outside and in cold areas then wool socks can help keep your feet warm. It is important to change your socks every day, or whenever they get wet, to keep your feet healthy while you travel. Carrying a small first aid kit that can remedy blisters, blood blisters and other foot problems is also important. Wearing sensible shoes while travelling is important for your health and safety. Only travel with shoes that you are comfortable with and that fit you well. Enlisting the aid of experienced shoe salespeople will help you narrow down the best options for your trip.